We have seen signs of the economic roller coaster turning positive for many months, joblessness has significantly decreased, the stock market has reached historic highs…and in a split second, during the Boston Marathon, the foundation of our security has been shattered once again. Much like 9-11, our complacency and naivety have led to shock and disbelief about the hatred that exists toward us. This, of course, is the plan of those directing terrorist activities. Undermine our basic security, kill and maim as many Americans as possible, devastate our stock market, and put fear into all of us. 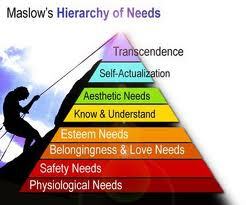 Everyone who has taken a basic psychology course has studied the work of Dr. Abraham Maslow, and his Hierarchy of Needs. Maslow’s theory suggests that people focus their energies satisfying the lowest order of needs (health, food and sleep) and only once those needs are somewhat satisfied, do they advance to the next level (safety, security, and freedom from fear). Once that level is basically satisfied, the people move to the third level (love and belonging), and so forth, up the ladder of needs. A key tenet of Maslow’s theory is that if suddenly a lower need is threatened, people immediately stop focusing on their present needs and all of their energy is refocused onto the threatened need. So, if someone is working on self-esteem, or personal/professional fulfillment (the highest order of needs) and then feels insecure or in danger, his/her energy then refocuses on attempting to satisfy the need for safety and security. Obviously, if your safety is in danger, you don’t need to be worried about self-esteem. So, beyond the personal devastation of the loss of life and limb, thousands and perhaps millions of Americans are going to sleep on April 15, 2013 worried about where the next terrorist attack may take place. This, added to the constant threats from the likes of Iran and North Korea, has again shocked us out of our complacency. What is the solution? This unfortunately rests with the politicians. All I can say, from a psychological perspective, is that people modify their behaviors according to the consequences of those behaviors. If their behaviors are met with swift and severe consequences, they will most likely modify those behaviors; on the other hand, if there are no apparent consequences, it is predictable that their behaviors will continue, unabated. The decision seems obvious. 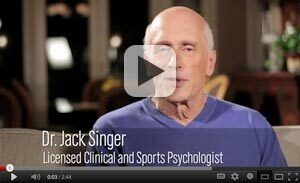 Dr. Jack Singer is a professional speaker, trainer and psychologist. He has been speaking for and training Fortune 1000 companies, associations, CEO’s and elite athletes for 34 years. Among the association conventions which Dr. Jack has keynoted are those which serve financial planners. Dr. Jack is a frequent guest on CNN, MSNBC, FOX SPORTS and countless radio talk shows across the U.S. and Canada. 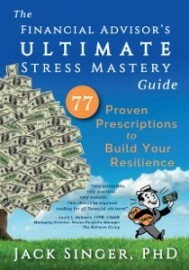 He is the author of “The Teacher’s Ultimate Stress Mastery Guide,” and several series of hypnotic audio programs, some specifically for athletes and some for anyone wanting to raise their self-confidence and esteem. 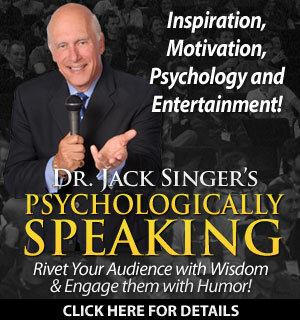 To learn more about Dr. Singer’s speaking and consulting services, please visit DrJackSinger.com and FunSpeaker.com or call him in the U.S. at (800) 497-9880.